I hope you are all well, and have been enjoying Amonkhet. As many of you know I don’t play Standard, but I do play a lot of Modern & Legacy. Yes, I know Sensei’s Divining Top was banned on Monday, and while I don’t agree with it 100% dwelling on it (let alone writing about it), will change nothing. It will hurt when I get my Counterbalances, and Tops back from getting signed though. Instead I have decided to move forward, and play other Legacy decks I have including one I have not played in a long time. At Epic Loot every Friday you have your choice of picking Standard, Modern, or Legacy. With Legacy happening at 6:30 pm, and Modern at 9:00 pm I chose to start with Legacy. My history with Jund style decks goes back a long way. When I first heard of FNM, and was wanting to play Magic beyond casual games at home, I wanted to play black & green type decks. Phyrexian Arena is in the short list of my all time favorite cards, and with it’s availability in Standard during Ravnica-Time Spiral Standard it was the push I needed. However while that card was not necessarily the best option at that time it wasn’t until this little guy was printed that I found another way to draw cards. Do not adjust your focus. This is what I look like. This little guy didn’t prove to be a big deal when he was first released, however professional play with this card proved otherwise. Suddenly this card became a foundation in nearly every deck, and many splashed green just to cast him. Shortly after that I realized that my Phyrexian Arenas may have been a little too slow, and I needed something…greater. Suddenly a powerful duo were formed, and I never looked back. Over time Wizards of the Coast released other cards that would soon get added to the pair, we would go to the plane of Alara, pick up Bloodbraid Elf, and the rest as they say is history. As I played a lot of Standard back then it was easy to slowly acquire key cards that would become eternal staples as they rotated out of Standard. Sure there may be some who say the deck is “bad”, or “you should play Shardless Sultai”, but the power of Cascade is one that can not be ignored. The goal of this deck is to use your disruption early, and often (especially via Deathrite Shaman) to disrupt their plan of attack, and eventually win through Bloodbraid Elf cascading into a Tarmogoyf, Liliana of the Veil, or a burn spell. While classified as a midrange deck if you can keep your opponent off balance early you can be aggressive, and keep your foot on the gas to the finish line. When playing this deck you hope for matchups against fair decks. Delver decks, Death & Taxes, and various other creature type decks. Decks like Reanimator, and Lands (perhaps our worst matchup) can be really rough. The current sideboard is still up in the air as we are in the post-Miracles meta, however it will become more refined as the meta evolves. One card I know I omitted was Maesltrom Pulse, and after facing a Lands player who had Nissa, Steward of Elements I won’t make that mistake again. Cards like Dismember, and Terminate are for creatures outside of Bolt range (delve creatures, and Eldrazi). Jund is a lot of fun, and may be a solid choice right now as the meta tries to have a defined direction going through the rest of the year. Now in Modern I also played Jund, but not Death’s Shadow Jund. I understand it’s power, and game plan from facing it a few times (and always seeing it on Modern coverage), however I’ve never really described myself as an aggro player. I also like the version of Jund I have anyway so I have chosen to stay behind, while the rest move ahead. Honestly I look at Death’s Shadow Jund as the Ralph Wiggum of Jund decks. You serve a purpose, but albeit very singular. One can think of it as a Turbo Jund, because the games are over pretty quickly. All kidding aside (besides who doesn’t crack up anytime Ralph Wiggum appears in a scene) the Death’s Shadow Jund-esque 4 color white splash deck…thing…is fine if you want to be super aggressive. You use your life as a resource a lot in any style of BGx deck, and that one is prime example of a deck that does a lot of that. Here in midrange land, just like in Legacy, we just want to disrupt your plan, play our creatures, our planeswalker, and win by card advantage. 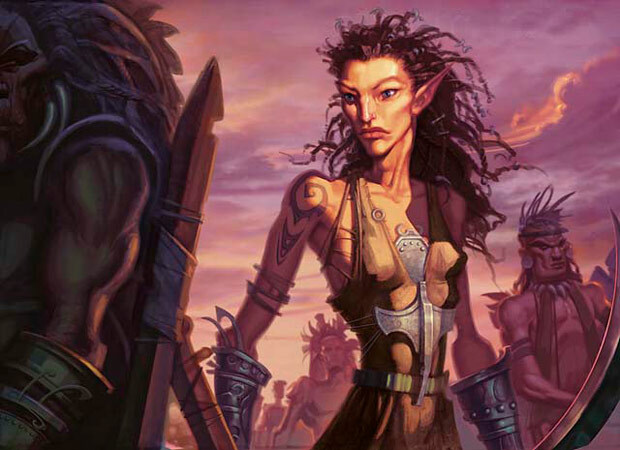 Notably absent are cards like Olvia Voldaren, and Thrun, the Last Troll. The former should be good again with the rise in decks like Affinity, and decks that use Lingering Souls, while the latter will get better as blue based control decks appear more often (which currently they are). I have fixed those issues with a new board going forward which hopefully will provide better results. Jund sideboards, in general, have always been a board with cards floating in and out depending on the expected meta. With an archetype that likes to sit right in the middle of the meta you have to bob and weave correctly, or you could wind up facing match ups that are not in your favor. Modern currently feels like it’s slowed down a great deal over the last 6 months. Not that games are going to time, but it feels like both players are able to fully play their cards instead of worrying about losing in 3 turns. One would say it’s quite healthy, and when you have a format that feels like that then archetypes like traditional Jund can thrive. That’s all for today folks. What do you think of the decks? What choices would you make for the main deck, or even sideboard, and why? Also remember when in doubt, Jund ’em out. …and until next time TAP MORE MANA! Nice article. Good insight into jund. Thank you for the comment. I am currently playing this deck in Modern, and should have some matchup results, and more insight next month.